It used to be thought that drinking during pregnancy was fine for the baby. Fetal alcohol syndrome wasn’t discovered until 1968, and even then the effects of drinking during pregnancy weren’t widely accepted for several years. It is now widely recognized that exposure to alcohol as a fetus can have physical, behavioral, and cognitive consequences. The more a woman drinks during pregnancy, the higher the risk to her baby. This risk includes miscarriage and cerebral palsy. There is also a characteristic pattern of alcohol effects known as the fetal alcohol syndrome. It is a major cause of mental retardation and congenital heart defects. Full-blown fetal alcohol syndrome occurs in one or two out of 1000 babies. Babies born to heavy drinkers have double the risk of those born to moderate drinkers. Babies born to moderate drinkers still have a 50 percent higher rate of birth defects when compared to babies born to mothers who did not drink during pregnancy. The classic symptoms of fetal alcohol syndrome include poor growth (short, thin babies with small heads), a characteristic face (with a thin upper lip), congenital heart defects (especially ASD and VSD), joint and limb problems, and developmental delay. Some children experience only mild effects, while others are profoundly affected. Is fetal alcohol syndrome contagious? It is not contagious, but babies only get it when exposed to alcohol by someone else. It is a lifelong condition. It is diagnosed based on the history and physical exam. There are treatments for some of the symptoms (heart surgery, for instance, is sometimes needed for the heart defects), but there is no treatment for fetal alcohol syndrome. Involvement of the appropriate team of therapists is important to help the baby reach his or her maximum potential. 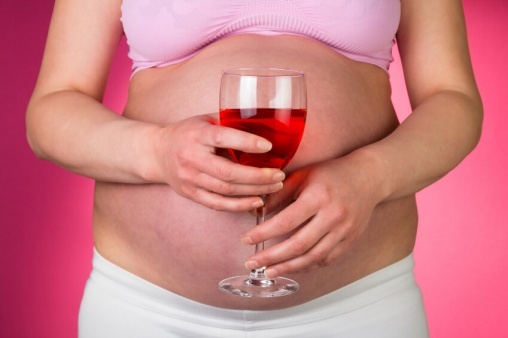 Avoiding alcohol during pregnancy reliably prevents fetal alcohol syndrome. Many parents ask if there is a “safe level” of alcohol consumption while pregnant. Studies have shown that consuming 1 or more alcoholic drinks (a drink is defined as 1.5 oz distilled spirits, 5 oz of wine, or 12 oz of beer) per day has been associated with increased risk of giving birth to an infant with growth retardation (Pediatrics, Vol. 106 No. 2 August 2000). Even when full-blown fetal alcohol syndrome is not present, attention problems, aggression, and delinquent behavior have been found to be three times more likely in children whose mothers who had as little as one drink per week during pregnancy (Pediatrics, Vol. 108 No. 2 August 2001).